Germany invades Denmark, Norway, France, Luxembourg, Belgium, and the Netherlands during World War II. Benjamin O. Davis, Sr. is appointed as a General in the United States Army, becoming the first African-American to hold such a position. President Roosevelt signs the Selective Training and Service Act, making it the first military draft to be created during a peacetime in the United States. Franklin D. Roosevelt is elected for an unprecedented third term as the U.S. president. Germany begins bombing London in what was known as "The Blitz" in an attempt to weaken the British Royal Air Force. The Mount Rushmore sculpture is completed. Japan launches a surprise attack on the U.S. base in Pearl Harbor, Hawaii, bringing the United States into the War. Italy and Germany also declare war on the United States. Soviet Russia and Japan sign a non-aggression pact. The Siege of Leningrad begins as German troops enter the Soviet Union, the siege will last until 1944. The G.I. Bill is signed by President Roosevelt, providing financial aid to World War II veterans. The draft age in the United States is lowered from 21 to 18. The famous and well-regarded film "Casablanca" premieres in New York City during the month of November. The Battle of Midway begins between Japan and the U.S. The U.S. Congress creates several branches of the armed forces for women to join the war effort, including the Army's Women;s Auxiliary Corps or WACs, the Navy's WAVES, the Coast Guard's SPARs, and the Women Air Force Service Pilots. The United States and Canada begin the unjust removal and internment of Japanese-Americans and Japanese-Canadians in the fear that they will become a security threat during the war. The Pentagon building is completed. Mussolini resigns from his position of power and Italy surrenders during World War II. General Dwight D. Eisenhower takes control of the Allied forces when he is appointed as the Supreme Allied Commander. Jacques Cousteau and Emile Gagnan invent the "Aqualung." An uprising takes place in the Warsaw Jewish Ghetto against the Nazis. President Roosevelt is elected to a fourth term in the United States, becoming the only person to ever do so. His fourth term does not last long however, as he died during the next year in April of 1945. Operation Overlord (D-Day) sees 150,000 Allied troops successfully storm the beachs of Normandy in France. Paris is soon liberated as the troops make their way through the country. Popular musician and band leader Glenn Miller is reported missing while on his way to perform for troops in Paris. Indian independence leader Mahatma Gandhi is released from prison. Poland is liberated from Nazi occupation by Soviet troops and the Polish Home Army. World War II ends as Allied and Soviet forces make their way towards Germany, liberating concentration camps along the way. The United States drops two atomic bombs on Japan, bringing an end to the Pacific side of the war. The United Nations is created after fifty nations sign the charter. Vietnam declares its independence from France under Ho Chi Minh. Harry S. Truman becomes the United States President after FDR dies. The ENIAC (Electronic Numerical Integrator and Computer), the first programmable electronic computer, is unveiled at the University of Pennsylvania. The Philippines becomes independent after being under U.S. rule for forty-eight years. The BBC resumes regular television broadcasting after being off the air during World War II. Department stores begin to sell Tupperware food containers. The former Prime Minister of England, Winston Churchill, gives his "Iron Curtain" speech. The transistor is invented at Bell Laboratories by William Shockley, Walter Brattain, and John Bardeen. India and Pakistan become independent from the United Kingdom. The Polaroid instant camera is demonstrated. Jackie Robinson becomes a part of the Dodgers, becoming the first African-American to play baseball for the Major League. Ferrari begins to produce sports cars. Israel is created as an independent Jewish state. The beloved Indian independence leader and pacifist Mahatma Gandhi is assassinated. Great Britain creates the NHS (National Health Service). George de Mestral, a Swiss engineer, creates Velcro but it is not formally patented until 1955. The first NASCAR race for modified stock cars is held in Daytona Beach. NATO (North Atlantic Treaty Organization) is established. Mao Zedong establishes the People's Republic of China. "The Goldbergs" airs live on CBS as one of the very first television sitcoms. The first test flight of the De Havilland Comet takes place, it would later become the first commercial passenger jet. 45 RPM records are introduced. The first ever use of a Nuclear Bomb during wartime when the US bombed Hiroshima and Nagasaki in Japan. Following the end of the war during the second half of the 40's marked the beginning of the East-West conflict and the Cold War. 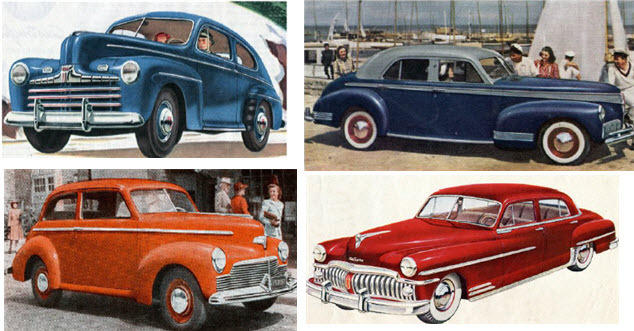 Practicality was of great essence during this time. Clothing was meant just to cover the body, and it was designed for the busy men and women involved in fighting or working during this time. 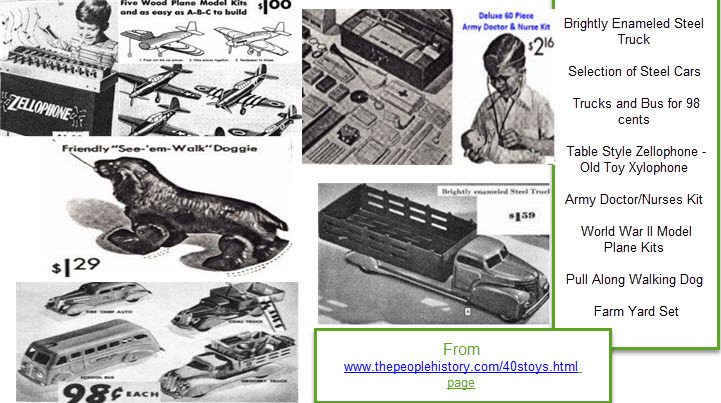 During the early 40's to aid the war effort few toys were sold 1. Because men were off fighting in Europe and Japan 2. anything that could be used to make toys steel / rubber etc. was also needed for producing tanks / ships / planes and other weapons. Following the end of world war II Jackie Robinson signed a contract to play first base for the Brooklyn Dodgers, breaking the color barrier in baseball. The famous Latin goal call is first heard, when Brazilian radio announcer Rebelo Junior. shouts (GOOOOOOOOOOOOOOAL) during a soccer match. Additional amenities of a Forties home would include items that are thought of as necessities by today's building standards. For instance, a hot water heater, barbecue patio, double garage, and/or heating system would be included in the sale of a specific home. The exterior of a home built during this decade was often of a red brick siding, and the interior home flooring was often of hardwood, just as it was in earlier decades. Other luxuries of homes included newly-installed roofing, kitchen cupboards, spacious rooms, and thermostat controlled heat.